When you decide to get married at your home, your to do list contains many things that a couple getting married at a venue wouldn't normally have to think about. You have to build a lot from scratch and it certainly eats up a significant chunk of your time available to take on other tasks. I haven't taken on too many labour intensive DIY's for this reason (I still have one big one I will share in the next couple of months). 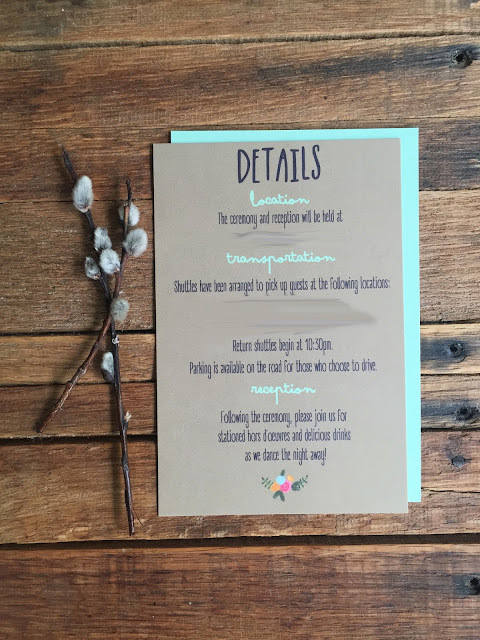 With our invitations, they weren't extremely time consuming per se, but a DIY that I definitely prioritized. I had so much fun creating them and seeing how they came together. And, while waiting out the Winter, I definitely had the time to take it on. I was actually kind of surprised how the math per invitation worked out on this one, because I really felt like this was a low-cost project because it was done over many months. Wedding planning at it's finest, you don't realize how much something is costing you until you add it all together! We ordered our invitations and RSVP cards from Vistaprint, and as a result we saved huge here. Because of our Save the Date credit, and a 40% off sale, we were able to order 100 of our invitation and RSVP cards for a fraction of the cost. Again, we also saved by ordering from the marketing side of Vistaprint versus the wedding side. Our invitation is a Vertical Medium postcard and RSVP cards are a regular 4 x 6 postcard. I also upgraded to recycled matte paper. While a thicker or nicer paper would have been nice to have, I feel better that we saved and used recycled paper on something that people will ultimately throw out. Had our details been lined up at the same time I had ordered the other pieces, this could have been significantly cheaper; however we still saved 20% off with a Vistaprint coupon. I also upgraded the recycled matte paper, and a coloured back. This was also a 4 x 6 postacard. Trust me when I say these cards are 10x cuter in person. They're just such a nice touch. I was able to save on our Mini Moo because of a referral credit (of $8.25). I almost forgot to include these in the cost round up because I bought these way back in November. I ordered 100 A7 and A4 envelopes in Grocery Bag from Envelopes.com. After receiving the last piece of the invitation suite, I did a test run of how they would look. This is when I realized that Envelopes had accidentally mislabelled one of their packages and sent the wrong size for our RSVP cards. They were really great about shipping the correct envelopes within a few days. I ordered two vector files from the Etsy shop mchLgstudios. I spent a lot of time searching, and since these files basically set the tone for the suite, they were well worth the money. I will admit these were a bit of an impulse purchase. I stumbled across them on Etsy and bought them before I even gave it any thought. Sticker splurge? Yes. Cute? Absolutely. While we did order this stamp specifically for our invitations, this will last us for years to come. I love that I was able to design the stamp with our own wedding fonts. I think this really tied everything together. I will note this was a bit of a headache purchase, shipping was rather high to Canada (but the best I could find in my searching) and when I hadn't received the stamp in over a month, I emailed to check-in and they hadn't even made it yet due to a technical error. I was a little disappointed the company didn't offer anything in exchange for their mistake. Also - I would recommend that if you do buy a self-inking stamp to test it out on a piece of paper about 20+ times before committing to your envelopes. It takes a little while to work them in. I actually ordered twine from the Etsy shop for our invitations. It's the twine you see in our photos. When I took a few sample invitations to be weighed at the Post Office, the twine was making them so thick that I was just at the point where our postage was oversized. I had some other crochet yarn in a very similar colour from Walmart ($5.00) that I used instead for the remaining invitations, which allowed us to mail our invitations at regular postage. The twine will be used in other wedding projects/crafting, so it wasn't a loss. For this purpose, I'm not including it in the total, and using the $5.00 yarn, as it was what was used on most of the invitations. I downloaded all of my fonts for free. We used arsenale white, Supernova and A Day Without Sun. Postage is a tough one to swallow, but I don't feel so bad knowing we saved so much hand delivering most of our Save the Dates. We had to pay oversized on the pre-assembled invitation suites with the original twine, and we have one guest from the States. We hand delivered one invitation (to our neighbour, GM Coach) and didn't put RSVP stamps on a few of our invitations (my parents and a few that told us not to). Seriously though, why is postage so expensive in Canada?! Overall, I'm pretty happy with what we spent on our invitations. We saved a significant amount in some areas by looking for sales and doing some research, which helped me justify some "splurges" in others (I'm looking at you completely unnecessary heart stickers). Ordering everything over a period of many months also made this a project where I didn't really feel the costs at all (even though it still added up to a decent amount of money). This project was a huge success for me. The feedback from our friends and family has been overwhelmingly positive and I really feel like we set the tone for our wedding. Were your invitations a save or a splurge? *US Exchange Price difference estimate - I purchased this a really long time ago and did a guesstimate on the exchange rate at the time of purchase. **An example of how a $13 purchase ends up costing you when the exchange rate is not in your favour. *** While we only mailed 87, we actually purchased 100 of everything. Hi! 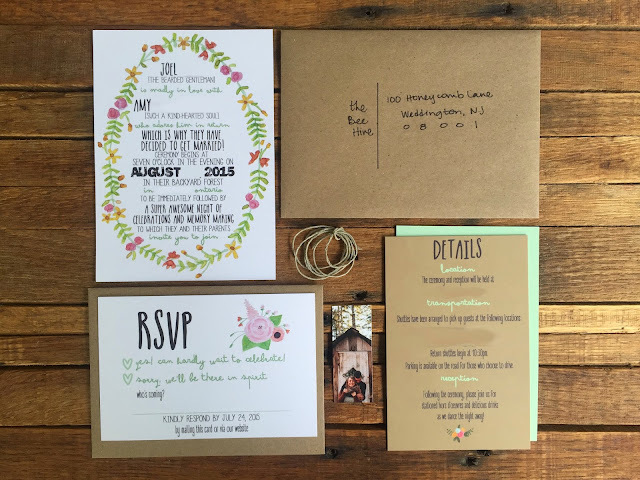 What software program did you use to create your invitation prior to uploading it to Vistaprint?